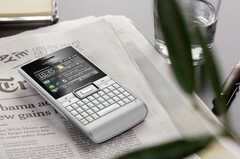 Sony Ericsson have added a business phone to their line up of eco-friendly handsets. The multi-tasking Windows Aspen joins the Elm and the Hazel in the Sony Ericsson Greenheart range. The phone’s general features reflect the business niche that Sony Ericsson are gearing their Aspen handset towards: the key point being the Windows Mobile 6.5 operating system, the latest version of the Windows phone set up that allows users to co-ordinate their phone with their PCs. And a Blackberry-ish shape with both a touchscreen and a full QWERTY keyboard makes easy typing a priority. On the entertainment side, there’s also a media player and a 3.2 megapixel camera. The phone has built in Facebook and Windows messenger apps and the “Human Curvature” design lets it fit in the palm of your hand more easily. It’s not just calling the phones after trees that make these phones eco-friendly. Their green credentials come from the manufacture, the packaging and factors like power-consumption. Green features on the previous Greenheart phones that we hope to see on this one come in three categories. – A Widget Manager application, which allows users access to their social networking page via the stand-by screen and quickly switch between different social networks, reduces the battery-wasting waiting time. 3. They come with apps for helping you cut down on CO2 and energy use in other areas of your life..
You can also use a special power-saving charger which minimises the power wasted when charging the phone. It will be available from April in Iconic Black or Silver White.